Access to purchase the menu for the duration of the Membership. On purchase of the weekly menu at a min. total weekly cost of AU$144/ NZ$158, receive a one-on-one consultation with a dedicated personal consultant, a personalised menu and activity plan, for that week. Further details can be found at jennycraig.com.au/terms / www.jennycraig.co.nz/terms or by calling 13 19 92 (AU) / 0800 502 302 (NZ). On purchase of the weekly menu at a min. total weekly cost of AU$144/ NZ$158, receive free delivery from selected Jenny Craig centres. Additional cost for vitamin supplements may apply. New and past adult members only. Excludes current members. A current member is an individual who currently holds a Jenny Craig membership, a new member is an individual who has never held a Jenny Craig membership and a past member is an individual who has previously held a Jenny Craig membership which has now expired. the free six-week membership offer is available only once per New Member. The free delivery offer is available multiple times during the six-week free membership period on the basis that the New Member spends a min total amount of AU$144/ NZ$158. not to be used in conjunction with any other offer, unless otherwise specified. offer conditional on New Member entering into the Jenny Craig Membership Agreement and satisfactorily completing an initial health screening. weight loss takes time and effort to be successful. Individuals should seek professional advice on diet, exercise and lifestyle changes, and consult with their doctor prior to joining the Membership. price of weekly menu may vary from time to time. subject to applicable laws, Jenny Craig may vary, update or terminate this offer at any time. offer commences on Sunday the 10th of February 2019.
offer ends on Saturday the 1st of June 2019.
one offer only per New Member. price of weekly Menu items may vary from time to time. offer commences on Wednesday the 26th of December 2018. Offer is for new, current and returning clients with a valid Jenny Craig Program to receive free delivery from selected Jenny Craig Centres. As part of the Program, to activate the offer, clients must spend a minimum of AU$144 / NZ$158 in one transaction, on Jenny Craig Menu items. it is available to new, returning and current clients. A new client is an individual who has never held a Jenny Craig Program, a current client is an individual who holds a current Jenny Craig Program and a returning client is an individual who has previously held a Jenny Craig Program but has not visited a Jenny Craig centre in over three (3) months. the offer may be redeemed multiple times, as long as the client holds a valid Program and incurs a total minimum spend of AU$144/NZ$158 on Menu items. Delivery is not available to all locations, and only to addresses within postcode areas nominated by Jenny Craig. Clients should contact their Centre / refer to their individual agreements for delivery terms and conditions. standard Jenny Craig program agreement and health screen eligibility conditions apply. offer is not transferrable or exchangeable and cannot be redeemed for cash. weight loss takes time and effort to be successful. People should seek professional advice on diet, exercise and lifestyle changes. offer commences on the 10th of February 2019.
offer ends on the 1st of June 2019. Offer is for new, returning and past adult members to receive a $40 food discount on the purchase of a weekly Menu for one week only (Discount). Total cost from AU$104/ NZ$118 (based on current price of full weekly recommended Menu (Weekly Menu) (after application of the Discount). On purchase of a Weekly Menu, receive a one-on-one consultation with a dedicated personal consultant, a personalised menu and activity plan, for that week. Further details can be found at www.jennycraig.com.au/costs / www.jennycraig.co.nz/costs or by calling 13 19 92 / 0800 502 302. Additional costs for delivery and vitamin supplements may apply. new, returning and past adult members only. Excludes current members. A current member is an individual who currently holds a Jenny Craig membership, a new member is an individual who has never held a Jenny Craig membership, a returning member is an individual who has a current unexpired Jenny Craig membership but has not visited a Jenny Craig centre in over 3 months, and a past member is an individual who has previously held a Jenny Craig membership which has now expired. one offer only per new, returning and past member. the Weekly Menu is payable in full at the time the offer is applied. offer conditional on member entering into the standard Jenny Craig Membership Agreement and satisfactorily completing an initial health screening. offer is for a limited time of one week only, commencing on Sunday, 21st April 2019 and ending on Saturday, 27th April 2019. Offer is for new, returning and past members at Albany NZ only, to receive a $30 food discount each week that the full weekly Menu is purchased (Discount). Total cost for 1 week from NZ$128 (based on current price of full weekly recommended Menu (Weekly Menu) (after the application of the $30 Discount. Members must purchase 4 weeks of the Weekly Menu to receive the total $120 discount (applied in $30 weekly instalments). Total cost for 4 weeks from NZ$512 (after the application of the $120 Discount). The offer does not include the Menu items, complementary or additional foods, vitamin supplements or delivery costs, which are additional. Weekly consultations, personalised menu and activity plan only available when the Weekly Menu is purchased for that week. Further details can be found at www.jennycraig.co.nz/costs or by calling 0800 502 302.
the Weekly Menu is payable in full each week. offer commences on Sunday, 7TH April 2019.
offer ends on Saturday, 5TH May 2019.
only a Current Member can refer a New Member to Jenny Craig. A Current Member is an individual who holds a valid Jenny Craig membership. A New Member is an individual who has never been a Jenny Craig member. only valid once Jenny Craig has verified the referral, and when the New Member purchases a Jenny Craig membership and one week of the full Menu. the balance of the Menu items (if any) must be paid at the same time as redeeming the Discount. only one Discount may be redeemed per referred New Member. Discount is non-refundable, not transferrable or exchangeable and cannot be redeemed for cash or credit. New Member must enter into the standard Jenny Craig membership agreement and satisfactorily complete an initial health screening. weight loss takes time and effort to be successful. People should seek professional advice on diet, exercise and lifestyle changes and consult with their doctor prior to commencing any Program. Discount valid until 31st of December 2019. Any unused value may not be refunded. Provide Jenny Craig with the Current Members details who referred you for verification, purchase a Jenny Craig membership and one week of the full Menu (Total minimum weekly Menu cost $158), to receive a $100 discount off the first week’s full Menu purchase. Best results experienced when Membership used in association with full Menu at an additional cost. Weekly consultations, personalised menu and activity plan only available when full Menu purchased for that week. T&C’s apply, visit www.jennycraig.co.nz/terms. only valid once Jenny Craig has verified the referral. the Membership Fee and the balance of the Menu items must be paid at the same time as redeeming the Discount. offer conditional on member entering into the standard Jenny Craig membership agreement and satisfactorily completing initial health screening. price of Membership and Menu items may vary from time to time. The promoter is Jenny Craig Weight Loss Centres Pty Ltd ABN 61 006 109 842 trading as “Jenny Craig” of Level 1, 464 St Kilda Road, Melbourne in the State of Victoria 3004 Australia (Promoter). Information about how to enter the competition, and the prizes available, form part of these Terms and Conditions, and are available in Jenny Craig centres or online at jennycraig.com.au/terms / www.jennycraig.co.nz/terms. Participation in this competition is deemed to be acceptance of these Terms and Conditions. This competition commences at 09:00am AEST on 11 February 2019 (Commencement Date) and finishes at 12.00pm AEST on 31 December 2019 (Close Date). Entry and participation in this competition is only open to current and former Jenny Craig members of an Australian or New Zealand Jenny Craig Centre, who are residents of Australia or New Zealand, and subject to these Terms and Conditions. This competition is a game of skill, whereby each entrant must, between the Commencement Date and the Close Date (Competition Period), submit an entry form via Jenny Craig’s approved competition page, https://pages.jennycraig.com.au/success-stories-competition / https://pages.jennycraig.co.nz/success-stories-competition, including the entrant’s name, gender, age, phone number, email address, details of the Jenny Craig centre attended, weight loss amount, current weight, goal weight, before and after pictures, and a description in 25 words or less about why or how Jenny Craig changed the entrant’s life (Entry Form). Entrants may be required to be available for an interview with the Promoter via Skype or another similar channel. Chance plays no part in determining the winners. At the conclusion of the Competition Period, a panel of judges will individually judge each entry, based on the merit of the answers provided to the questions posed on the Entry Form, and the Entry Criteria identified below. Employees of the Promoter (and their immediate family members) and agencies associated with this competition are ineligible to win a prize. For completion, immediate family member includes a spouse, ex-spouse, de-facto spouse, child or step-child (whether natural or by adoption), parent, step-parent, grandparent, step-grandparent, uncle, aunt, niece, nephew, brother, sister, step-brother, step-sister or first cousin. As a condition of entry into this competition, entrants acknowledge that a profile of each eligible entrant (based on the information contained in their Entry Form) may be published at any time by Jenny Craig, as deemed appropriate in Jenny Craig’s absolute discretion. The Promoter reserves the right to, at any time, verify the validity of entries, (including their identity and age) and to disqualify any entrants whose entry is not submitted in accordance with these Terms and Conditions, or who otherwise tampers with the entry process. Errors and omissions will be accepted at the Promoter’s absolute and unfettered discretion. Failure by the Promoter to enforce any of its rights at any stage does not constitute a waiver of those rights. Only one entry per eligible entrant will be permitted. up to four (4) winners will be selected to appear in a Jenny Craig television commercial (TVC) and will win a prize up to the value of $5,000 (AUD / NZD). The prize will include an all expenses paid trip to Melbourne, Victoria, Australia, a photoshoot with a celebrity photographer, a $3,500 (AUD / NZD) cash prize and the Promotor’s goodie bag. The Promoter is not under any obligation to feature the winner in any TVC, nor award additional prizes. The winner of the $1,000 (AUD / NZ) cash prize in clause 12(b) is unable to also be a winner of the prize set out in clause 12(c). The finalists and winners acknowledge that all material gathered and produced as a result of their entry will be owned by the Promoter, and the finalists and winners consent to the use of their image in the same. The finalists and winners agree to sign any legal documentation, and provide any additional information required, in the form determined by the Promoter in its absolute discretion, to give effect to this consent and appropriately advertise the entry. The winner of the $1,000 (AUD / NZ) cash prize in clause 12(b) will be informed by 5:00pm AEST on 31 January 2020. Prizes are not redeemable for cash and are not transferrable. All vouchers and prizes are to be awarded by a provider selected by the Promoter in its absolute discretion. Prizes are subject to the terms and conditions of each individual service provider. The Promoter’s decision is final in all aspects of this competition and no correspondence will be entered into. with regard to any materials submitted via the competition, including answers to competition questions, comments, recordings and images (Content), unless the Promoter advises otherwise, the entrant grants the Promoter, its affiliates and sub-licensees a non-exclusive, royalty-free, perpetual, worldwide, irrevocable, and sub-licensable right to use, reproduce, modify, adapt, publish and display such Content for any purpose in any media, without compensation, restriction on use, attribution or liability. The entrant agrees not to assert any moral rights in relation to such use. The entrant warrants that they have the full authority to grant these rights. they will comply with all applicable laws and regulations, including without limitation, those governing privacy, publicity and the access or use of any other persons’ computer, technology or communication system. Without limiting any other terms herein, the entrant will fully indemnify the Promoter for any breach of these Terms and Conditions. The entrant consents to the Promoter using their name, likeness, image and/or voice in the event that they submit a winning entry (including photographs, films and/or recordings) in any media, for an unlimited period of time, without remuneration or compensation, for the purpose of publicising the competition (including any outcome), and marketing or publicising any products or services manufactured, distributed and/or supplied by the Promoter. modify, suspend, terminate or cancel the competition. taking of, or using, any prize by a finalist and/or the winning entrant. The laws of the State of Victoria in Australia (for entrants located in Australia) or the laws of New Zealand (for entrants located in New Zealand) apply to this competition and these Terms and Conditions, to the exclusion of any other law. Eligible entrants submit to the exclusive jurisdiction of the courts of the State of Victoria in Australia or New Zealand, as appropriate. Excludes current members. A current member is an individual who is currently participating in any Jenny Craig Program and has attended a Jenny Craig centre for a consultation in the last three (3) months. only valid on presentation of Discount Voucher, which must be surrendered when Discount Voucher redeemed in full. the balance of the Membership Fee and/or Menu items must be immediately paid by the member, at the same time as redeeming the Discount Voucher. only one Discount Voucher may be used per transaction. Discount Voucher is non-refundable, not transferrable or exchangeable and cannot be redeemed for cash or credit. Jenny Craig will not accept responsibility for any lost or stolen Discount Vouchers. member must enter into the standard Jenny Craig membership agreement and satisfactorily complete initial health screening. Membership Fees and cost of Menu items may vary from time to time. Discount Voucher valid until the date listed on the Discount Voucher, or 10/03/2019, whichever is earlier. Any unused value may not be refunded. Home delivery will only occur for addresses within the postcode areas nominated by us from time to time. During the ordering process, you will be required to select a date and delivery window for your order to be delivered. You will provide us with complete and accurate information to complete your order. All efforts will be made to deliver your order on the date and delivery window selected, however due to events beyond our reasonable control; we may not be able to do so and will not be liable to you or any other person for any such delay. If your address is within the postcode nominated by us, we will deliver the order to the front door of your nominated delivery address. If you request your order to delivered inside a premises or a building, and we agree to do so, then you are responsible for any loss or damage suffered in connection with our delivery of your order beyond the front door. You must make all necessary arrangements to allow your order to be delivered, including obtaining any prior security or approvals which may apply to your delivery location. If your address is outside of the postcode areas nominated by us, then your order will be delivered to a central business location or central pick-up location, nominated by us. You will then be required to collect your order from this central business location or central pick-up location. You may be required to provide us with appropriate proof of identity. If the order has been paid by credit card, you may also be asked to show the credit card in order for verification checks to be conducted. Jenny Craig accepts no liability or responsibility for incorrectly placed orders. Nor do we accept liability or responsibility for delivery details which are incorrectly supplied, or you fail to supply. If you will not be at the delivery address at the expected delivery time, we recommend you nominate a cool safe place for delivery of your order. If you do not provide a specific place for delivery, your order will be left at your front door. If you advise of any specific delivery instructions in your order, all reasonable endeavours will be made to comply with these instructions to the extent reasonably within Jenny Craig’s control. You will be responsible for the order from the time your products are delivered in accordance with your instructions. Jenny Craig accepts no liability or responsibility for any product or order once the product or order has been delivered to you. You understand that Jenny Craig may need to change your delivery date and time from time to time. You will be notified as soon as reasonably practicable if your delivery date and time changes for any reason. 5+2 Independent Menu Plan means 5 days of Jenny Craig breakfast, lunch, dinner, snack and vitamin items, which form part of your individualised menu, and 2 days a week on your own. 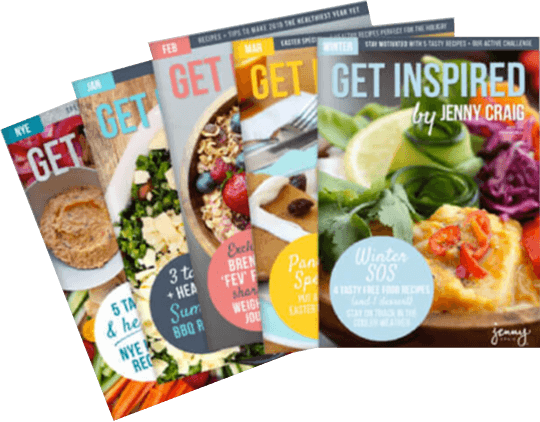 6+1 Independent Menu Plan means 6 days of Jenny Craig breakfast, lunch, dinner, snack and vitamin items, which form part of your individualised menu, and 1 day a week on your own. Adolescent means a person between 13 to 17 years of age. Adolescent Menu Plan means the full weekly menu plan offered to Adolescents from time to time. Agreement means this My Loyalty Reward Agreement. Centre means the Jenny Craig Centre where you enrolled in the Membership. Commitment Period means the period that commences on the date that your Reward starts, for a minimum period of 12 consecutive weeks, or longer as requested by you, subject to the terms of this My Loyalty Reward and your Membership Agreement. Jenny Craig, our or us means Jenny Craig Weight Loss Centres (NZ) Limited (Number 271677). Membership means the Jenny Craig Membership you enrolled in pursuant to your Membership Agreement. Membership Agreement means the Membership Agreement you entered into with us to enrol in the Membership. Menu Plan means 7 days of Jenny Craig breakfast, lunch, dinner, snack and vitamin items, which form part of your individualised menu, and when determined appropriate by your Jenny Craig consultant, includes both the 6+1 Independent Menu Plan and 5+2 Independent Menu Plan. to be eligible for this My Loyalty Reward offer, and Reward, you must have a current Membership Agreement and Membership with us, which you have paid for in full. we agree to provide the Reward to you in consideration for you agreeing to the Commitment Period and purchasing the full Menu Plan weekly, or in the case of Adolescents, purchasing the Adolescent Menu Plan weekly, during the Commitment Period and otherwise complying with the terms and conditions of the Membership Agreement and this Agreement. you may be entitled to suspend the Commitment Period for no longer than a total maximum period of 2 weeks during the Commitment Period without affecting your eligibility to receive the Reward, by notifying your Centre of the proposed suspension, and the proposed suspension subsequently being accepted by us, acting reasonably. you agree that if you stop purchasing the Menu Plan or cancel or terminate the Membership Agreement at any time during the Commitment Period, other than as permitted by this Agreement, you will not be entitled to the Reward. this My Loyalty Reward is not available in conjunction with any other offer and may not be transferred, redeemed for cash, credit or products (including Menu items). we may vary, update or terminate this My Loyalty Reward or this Agreement at any time by varying, updating or removing it from https://www.jennycraig.co.nz/terms. Variations and updates will be effective for new members from the date of the variations and updates. Termination of this My Loyalty Reward will not affect existing members, including yourself, who have accepted the My Loyalty Reward Offer prior to the date of termination, unless otherwise agreed by you. Offer is for new adult clients to receive a free no obligation weight assessment with Jenny Craig. new adult clients only. Excludes current and returning members. A current member is an individual who is currently participating in any Jenny Craig Program, a new client is an individual who has never participated in a Jenny Craig Program, and a returning member is an individual who has previously participated in a Jenny Craig Program but has not visited a Jenny Craig centre in over three (3) months. redeemable once per new client. to redeem this offer, the new client must attend a participating Jenny Craig centre by appointment only, and refer to this promotion at the time of booking. appointments are subject to availability and available appointment times may be limited. offer subject to client satisfactorily completing health screening. offer is not transferrable or exchangeable and cannot be redeemed for cash, credit or any products (include Menu items). by participating in this offer, the client is not participating in any of Jenny Craig’s weight loss programs and this offer is for the client to receive a weight assessment only. weight loss takes time and effort to be successful. People should seek professional advice on diet, exercise and lifestyle changes and consult with their doctor prior to participating in this offer. offer commences on Sunday the 4th of March 2018.
offer ends on Saturday the 31st of December 2018.